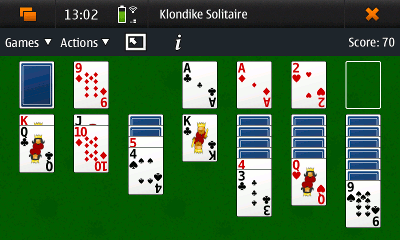 Mozcards is a collection of patiences (card games), for the Maemo platform. I use it on my N900. 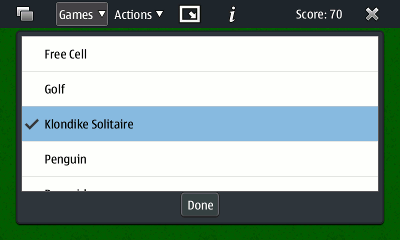 In fact it's an adaptation of Cards, a Firefox extension, by Stephen Clavering. 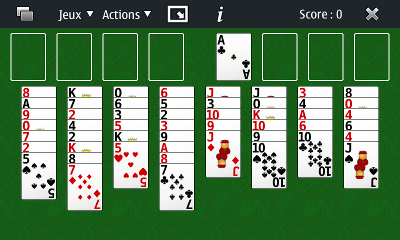 Based on XULXRunner, and adapted to the interface of Maemo. This application is for Maemo 5, so in a Nokia N900. You must have Firefox Mobile (aka Fennec) installed before, version 1.1 or newer. Then simply download the .deb file, and open it with the file manager (you must have installed all system update for that). The file README in the archive details all you need to build the application and package it for the Maemo platform. Some games wich need more space are deactived for the moment. Try a little set for these ones. Separe maemo specific parts in the build system, to propose the application for other platforms.